Boston Bruns president Cam Neely has made it clear that the club intends to sign forward Brad Marchand to an extension before he becomes a free agent after the 2016-17 season. 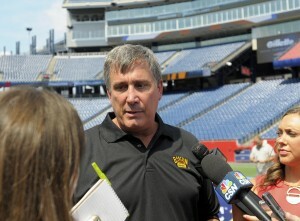 In fact, Neely hopes to have Marchand inked to a new deal before the start of the season. Marchand, 28, is entering the final year of his four-year, $18 million contract and had a career year this past season. In 2015-16, Marchand set career-highs in goals (37) and points (60) in 77 games. Marchand was also an important part of the Bruins’ 2011 Stanley Cup team and has become more of a goal-scoring threat in the past few seasons for the team. Marchand’s new deal may come at a steep price for the Bruins given his age and performance in recent seasons. Marchand, who just turned 28, led the Bruins with 37 goals in 2015-16 and NHL general managers have demonstrated a willingness to pay a premium for goal scorers. In October 2014, the Ottawa Senators signed forward Bobby Ryan to a seven-year extension worth $50.75 million. At the time, Ryan was a four-time 30-goal scorer, and had a career-high 35 goals with the Anaheim Ducks in 2009-10. During his seven-year NHL career, Marchand has skated in 454 regular season games and tallied 153 goals and 135 assists, while adding 39 points in 66 postseason games. Marchand is a four-time 20-goal scorer and has eclipsed the 30-goal mark once in his career. Originally drafted by the Bruins 71st overall in the 2006 NHL Entry Draft, Marchand, along with teammates Patrice Bergeron, David Krejci and Zdeno Chara, has helped form the nucleus of the franchise for almost a decade.